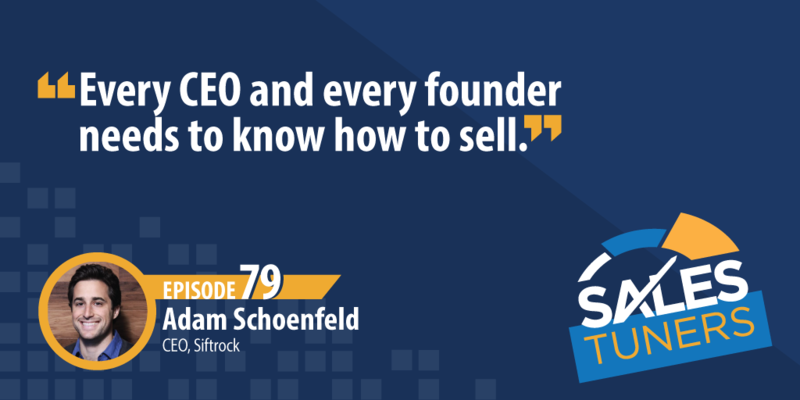 Meet the undercover boss, Adam Schoenfeld, (@schoeny) CEO at Siftrock, an email reply management platform that works behind the scenes to clean your databases inside of Marketo, Eloqua, HubSpot and many others. As an entrepreneur for the last decade, Adam’s interest in creating software eventually led him to sales. As CEO, he’s found it’s important to work closely with his sales team encouraging them to try what feels natural. In his years of experience, his best lesson in sales is get rid of the playbook everyone else is using. Sales conversations come down to people communicating so being able to humanize the data or information you’re trying to share is essential to developing the best results. One thing is clear, although he holds the ‘boss’ title Adam is refreshingly humble. He creates a culture of being excited to do any job regardless of what it is. It’s this type of approach to business that allows him to create lasting impressions with prospects, customers, and his team. Know What to do Next: You just made the investment in acquiring data, hashing out your target accounts and cold prospecting, but what happens when you actually get someone on the phone? Make sure you build out at least the basic infrastructure to know how to handle responses both positive and negative. If your goal is a meeting, make sure you’re not getting stuck in a 20-message email thread or look silly when your prospect ends up on your website talking to your chatbot. Put Your Hands on the Keyboard: Building from the last takeaway, when you work with smaller numbers, you have the opportunity to get more personal in your messaging. Instead of letting your sales automation do all the work, put your hands on the keyboard and customize your outreach. Make it obvious that your message could not have been meant for anyone else other than the person you’re sending it to. As Adam said,, you can only deliver your first impression once. Leverage Messaging from Paid Advertising: If your company has invested in PPC or any other forms of paid advertising, sit with them to understand what’s working. What headlines are getting the best click-through rate? Which messages are getting the best conversion rate? These tests make for great email subject lines as well as quick notes. But remember, the best messages don’t look like the came from sales or marketing — they look like they came from another human.